On December 15th, a information meeting on the various INTERREG European funding opportunities took place in Ille-et-Vilaine’s County archives in Rennes (Brittany). 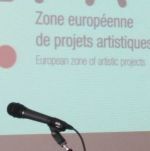 Jointly organised by Ille-et-Vilaine County’s Cultural and European Relations services, this information meeting aimed to encourage the cultural organisations of the County and the wider Region to get involved in European programs. Marie-Noëlle Le Kervern, INTERREG IVA France (Channel) - England Program Animator for Brittany. As part of the event, Mathilde Vautier, ZEPA General Coordinator, Marine Lecoutour, Communication Assistant at Le Fourneau and Aude Pauchet, ZEPA trainee talked about ZEPA’s application process and objectives, benefits and challenges. Interesting topics, even if there was little interaction with the audience, made of around forty representatives from various Brittany-based cultural organisations.